Pets are an incredible addition to any family. However, we sometimes forget the they, like us and our children, need to be challenged throughout their day. Imagine how boring your life would be if you were laying around all day except for two walks outside for a total of 20 minutes? You don’t want that for yourself or your children – and you don’t want it for your dog either! Take some advice from your Little Rock vet, and try these techniques to keep your dog challenged, healthy, and happy. The breed of your dog will have a lot to do with what activities and challenges they enjoy. Sometimes you can tell the breed by simply looking at your pet. Other times, it may be more difficult. If you’re really curious, you can always have them tested at a Little Rock vet. Some dogs were specifically bred for hunting, and so the activities they’ll love most will have to with searching and retrieving. Others love swimming, and others are suited for agility activities. Knowing the breed will help you know where to focus! Of course, not all “water dog breeds” love water, and not all hunting dogs love the same activities and games. You’ll want to experiment with different activities and games. What are some activities that will help your dog stay challenged, interested, and alert? Here are some ideas we were able to come up with at our Little Rock vet. Many dogs are incredibly smart and eager to please, which makes it easy to teach them tricks. Start with basic commands, of course, but feel free to reach well beyond that. Tricks are a fun way to build your bond with your dog while keeping them challenged and entertained! Did you know they make dog-oriented board games? You can get one to play with your pet, or you can create your own. Consider frisbee, hiding treats, or hiding a toy so they can sniff it out. Create an obstacle course in your home or outside so they have to go over, under, through, and around a variety of items. You can also buy fun toys that allow you to let your dog figure out where the treat is hidden, and then move it so they have to try again. You don’t need tons of space, just some creativity! Getting your dog into new environments can give them unique stimulation and help break them out of a rut. Whether it’s a ride in the car or a romp in a different park, taking your pet with you can help challenge them. As an added bonus, they will meet new people and other animals and learn more about socializing and acting appropriately. Be sure you don’t take your dog somewhere inappropriate. You don’t want to lock them alone in the car, or bring them into a store that doesn’t allow dogs. There are a lot of places that will welcome your dog. 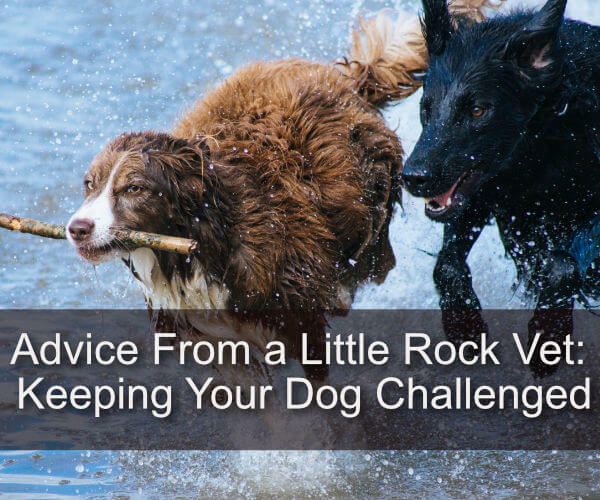 A trip in the car for the dog can end up a lot more places than just your Little Rock vet! We love to see precious pets happy and healthy! If you have concerns about your dog, or are curious what breed they are, let us help. You can contact your Little Rock vet anytime with questions or to make an appointment. Let us know what you need!